The origins of the demonstrational armillary sphere are uncertain. The archaeological record is slight, and the early textual evidence ambiguous. In the Timaeus, for example, Plato spoke of the difficulty of understanding the planetary motions without the aid of a model, and some have taken this to refer to an armillary sphere. Cicero, in his De Republica, stated that Archimedes had constructed a model to show the heavenly motions, presumably some form of globe or armillary; Plutarch added that he had written a treatise on it called Sphere-making. Cicero also wrote, in the De Natura Deorum, of a sphere invented by the Stoic philosopher Posidonius (c. 135 - c. 51 B. C.), which reproduced the diurnal rotation of the sun, moon and five planets mechanically. Occasionally described as "orreries" (a form of planetarium devised in the eighteenth century), these sphaerae could have been demonstrational armillaries with a mechanical component. 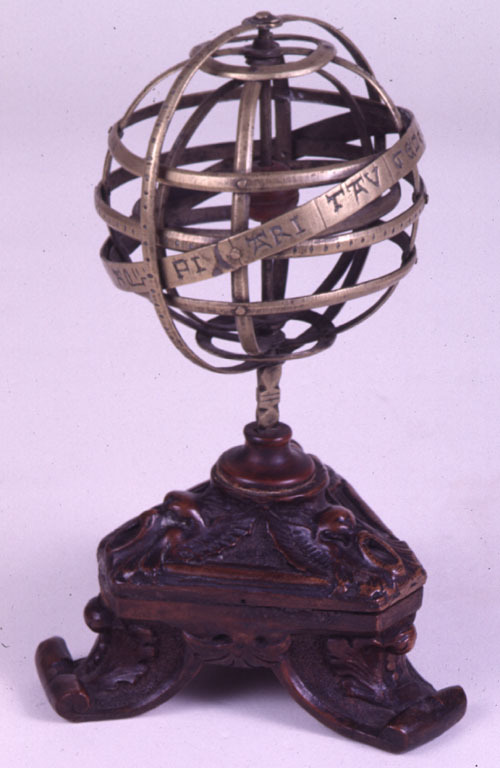 This armillary sphere in the Whipple Collection, thought by some to date from the mid-fourteenth century, may be the earliest demonstrational armillary to have survived. The wooden sphere at the centre of the armillary represents the Earth; such spheres were a common feature of demonstrational armillaries, and were frequently marked as terrestrial globes. The base is probably a later addition. In his Attic Nights, Aulus Gellius reported the criticism of Marcus Varro (116 - 27 B. C.) that a spherical model, which he implied was a Greek invention, could not represent all the circles of the celestial sphere. Martianus Capella (fl. 480 A. D.), in The Marriage of Philology and Mercury, had Astronomia herself express a similar opinion with reference to the "axis and poles which mortals have fastened together in a bronze sphere to assist them in comprehending the heavens" - a description highly suggestive of a demonstrational armillary. Clear references to demonstrational armillaries are absent from the documents of the Islamic world. Yet Gerbert d'Aurillac (c. 945-1003), who became Pope Sylvester II in 999, is credited with introducing demonstrational armillaries into medieval Christian Europe, and it is often assumed that he acquired knowledge of the instrument via Islamic Spain. Gerbert's correspondence reveals that he employed at least two types of spherical model, both equipped with sighting tubes for alignment with the heavens. The widespread use in medieval universities of treatises on the geometry of the celestial sphere, particularly Sacrobosco's De Sphaera, suggests that the demonstrational may have been quite common in the late-medieval period. Artistic representations of the armillary sphere, in manuscript illuminations and statuary, frequently show the axis of the sphere extending from the southern pole to form a handle. This form of armillary also features in early-modern depictions, but many of the armillary spheres surviving from the sixteenth and seventeenth centuries possess a stand and cradle equipped with a horizon ring like that of a celestial globe. When divided, a demonstrational armillary sphere could, like a celestial globe, be used for calculations: assisting, for example, the transformation between different celestial co-ordinate systems. Surviving armillary spheres, most of which post-date 1500, indicate that the instrument was often constructed from precious material as an objet d'art for princely collections. Such demonstrational armillaries display a variety of forms and features: some were equipped with star-pointers like an astrolabe, some possessed a mechanical drive to simulate the rotation of the heavens, and some included circles to represent the orbits of the planets. They ranged in size from monumental pieces to tiny armillaries surmounting decorated celestial globes and astronomical clocks, even finger-rings which opened out to become spheres. Later, particularly in the eighteenth century, armillaries of wood and pasteboard were sold in addition to those constructed from metal; they were frequently produced in pairs which represented both the Ptolemaic and the Copernican planetary systems at their centre.